Here’s the story of an 8-year old called Ryan. A story that will melt your heart! PS. You will want some tissues. 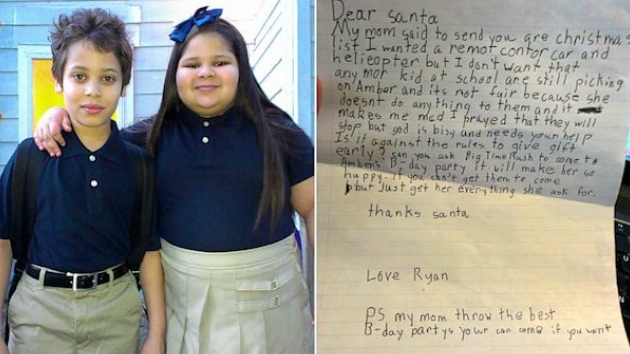 Ryan just wanted one thing for Christmas – he wanted Santa to help his sister Amber so that kids would not bully her again. But you will not believe who came to their rescue instead! It’s true that these days bullying has become a common norm in schools and children can sometimes do nothing, but succumb to it and it breaks my heart that they have to go through it. So here’s to those who want to put an end to bullying – believe in yourself and reply with courage! Thank you simonyoung51 for posting this on YouTube! It’s time to clean your house after avoiding the thought for over 5 minutes! Let’s look at the top ten secrets that’ll make a busy mom or a weekend dad smile ear to ear! Place paper towel rolls and multi-purpose cleaners in each bathroom. Your brooms, dusters and mops should be kept close to the area where you use them the most. Also, chose supplies and cleaners that multi-task. It’s better to de-clutter the floor first. Once this is done, the room will look tidier! Usually the kitchen is the only place you’ll find all sorts of work, from large to tiny ones. Start with the tiny ones that will take you about 5 minutes to complete. After you’ve finished your business in the bathroom, what can you do while you’re still there? Maybe clean the bathroom mirror or hang up towels and tidy up the bathroom in less than a minute. Don’t skip through TV commercials; instead use them to get some work done. Perhaps that mug of coffee on the coffee table that’s waiting to be picked up? Play Math in Each Room! Divide the chore, subtract the waste and add it to the bag! Vacuuming becomes easier and faster when the room is less a mess! While a machine does a task, do something else. If you have 5 minutes then clean bathroom basins. While you wait for the dryer, dust the living room. While your dishes are drying, collect garbage from around the house! When the machine rests, take a short break! It’s never a good idea to spend an entire weekend doing your laundry. Instead if you’re too busy, schedule your laundry to run 3 times every week. Dropped water? Clean it up. Biscuit crumbs? Clean them up immediately. If you wait, the mess grows; instead, tackle them as soon as they happen. While watching your favorite TV show, dice, cut and prepare your vegetables! Toast bread for brunch or simply prepare your salad! There are many parts of parenting that can sometimes be difficult. Parenting teenagers can sometimes be more of a challenge than parenting elementary students. Our teenagers know a lot more than we do, or at least that is their opinion. Having troubled teens can cause any set of parent’s trouble. There are several different tips that can help us as parents deal with troubled teens. Struggling teenagers are never something that parents want to deal with. One thing that sometimes parents forget is that it can take a village. You may not need others to parent your children for you, as you did once when they were little. However, now it is important to rely on the village for verbal and emotional support. Along with trusting others you need to trust and care for yourself. Many times the stress of parenting a troubled teenager can cause harm on a parent’s body. There are several things that can help a parent improve their emotional and physical needs. Be aware of your own depression and anxieties. It is important to watch for the signs within yourself. If it is needed be sure that you get professional help. Relaxing can be helpful as well. Learning how to de-stress daily can be very important when dealing with troubled teenagers. It is important that our teens know that we are not going to give up on them, even when they become troubled. Our teenagers are children after all, and just as when they were little they need to know that they are accepted and loved. We as parents may not love what our children are doing, however we need them to always know that we are there. Try finding a common ground. This common ground doesn’t have to have anything to do with their troubles. It can be as simple as sharing a special meal, or a favorite television show together. Be sure that the common interest is something that can be talked about peacefully. It shouldn’t worry about being your children’s friend, however having peaceful interactions can be one of the most important parts of being a parent. There are several ways that we can be a parent. Sometimes one of the best things that we can do for our troubled teens is be a better parent. When it comes to being a better parent there are a lot of changes that everyone can make. However, when it comes to teens parenting it is a little different. Listening is an important step to parenting. However, for teenagers listening without judgment. One of the hardest things is to listen without judging or not offering advice. As parents we always want to give advice and fix our children’s problems. However, many times our teenagers just need to be listened to. Teenagers are sometimes upset at can be harsh to their parents. It is important that no matter what we expect their rejection sometimes. When they offer rejection, it is important for us as parents to relax and offer the teens the space they may be needing at that time. No matter how troubled our children are it is important that we remain calm and helpful. It is important to remember that there are tons of tips that parents can use to help themselves and others who are having trouble with their teenagers. The drunk driver who hit his daughter got 15 years, but her sentence was for life. John Seaman’s 20-year old daughter Kelly was hit by a drunk driver in May 2012, becoming yet another statistic brought to grief by a drunk’s negligence behind the wheel. As reported by Little Things, almost every single day, about 30 people die from road accidents in the United States and the reason? Drunk driving. This amounts to one death every 51 minutes. But John wanted his daughter’s plight to matter, so he took an extra step outside his grief to communicate to the world. Shortly after the accident, John posted a video where he introduced his daughter lying in a hospital bed, showing the results of her massive injuries. But the story didn’t end there. A little over a year later, he posted another message. Go to the next page to see the final chapter to this story. 8 Amazing Hairstyles Your Toddler Girl Will Love!